(Franklin Square, N.Y., Jan. 28, 2019) – The Long Island Ducks kicked off their week with a TD Bank “Take a Duck to Class” visit at Willow Road Elementary School. Michael Zeppieri, a fourth grade student at the school, was recognized for writing a winning essay in the annual contest. Michael penned an outstanding essay regarding his school teacher, Mrs. Michelle Lepe, and why she is a “hero in his community.” Fourth grade students from the school, including Mrs. Lepe’s class, attended a morning assembly on Monday to congratulate Michael and hear him read the essay aloud. Michael was presented with several prizes for writing a winning essay. Eric Fishon, TD Bank Vice President of U.S. Field Marketing Strategy, and Melissa Cunha, TD Bank Valley Stream Store Manager/Vice President, awarded him with a $50 gift card and spoke to the students about the importance of teachers. The Ducks presented Michael with a ticket voucher for the team’s Opening Weekend Fireworks game on May 4th, so that he can enjoy a fun night at the ballpark with his family. Ducks mascot, QuackerJack, also visited the school and congratulated Michael on a job well done. QJ hung out in Michael’s classroom and signed autographs for all of Mrs. Lepe’s class. In addition, each of the students received special gift bags, courtesy of TD Bank, as part of the festivities. 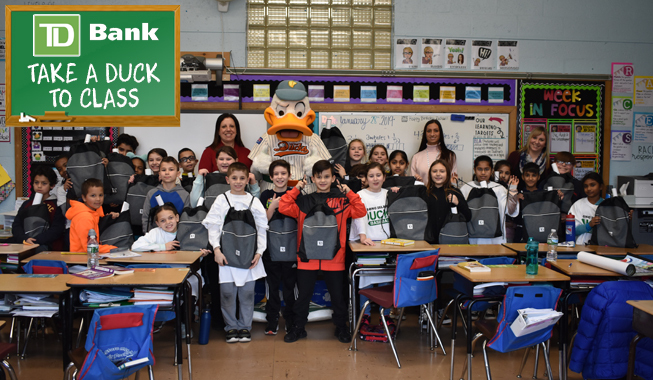 The Ducks will wrap up this year’s TD Bank “Take a Duck to Class” essay contest visits in February when they visit Dylan Wagner, a fifth grade student at Forest Avenue Elementary School in West Babylon.